The Words is a story within a story tale, about author Clay Hammond’s (Dennis Quaid) book about Rory Jansen, (Bradley Cooper) a young man who has just became the hottest American novelist overnight with his debut book about a young American man living in post-war France. The plot thickens (as they say) when it is revealed that Rory actually didn’t write the book but in fact found the manuscript in an old antique shop with his girlfriend Dora (Zoe Saldana). The plot continues to thicken when the original writer of the manuscript (Jeremy Irons) confront =s Rory about stealing his work in Central Park. The film cuts between Clay’s story and Clay reading the story to an audience and eventually Clay telling the rest of the story to a girl he’s attempting to seduce named Danielle (Olivia Wilde) who has been closely watching him the whole time. Written and directed by TRON: Legacy scribes Brian Klugman and Lee Sternthal, the duo’s directorial debut is a bit of a let down but should I really be surprised that the writers of the TRON sequel made another mediocre movie? However, there are a good number of twists thrown in throughout and the film moves at a fast pace that doesn’t give you time to take in just how mediocre everything is. Jeremy Irons gives a great performance (as always) as the old man who has had his life’s work stolen from him by some young punk kid who’s suddenly become both a celebrity and millionaire off of his lost manuscript. The rest of the cast delivers, but besides Irons nobody really stands out and in the end I’m still unsure of what type of career Bradley Cooper is aiming for. He seems to be trying as many genres as possible. Hopefully it works in his favor in the long run. Check out the movie if you’re a sucker like me for twists. There’s enough in there to make up for the somewhat muddled plot and an ending that will at the very least have you talking for the next 5 minutes with whoever you see the movie with. 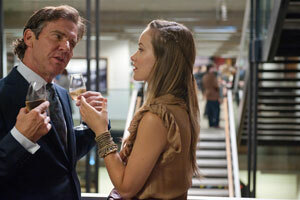 The Words opens today in Philly area theaters.